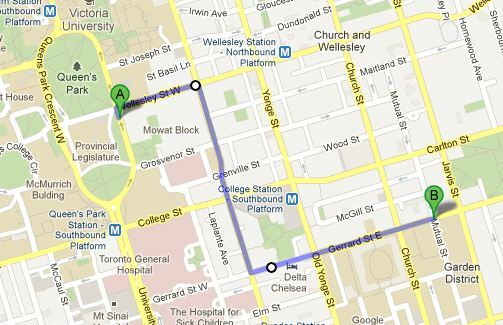 The route for the 2018 Toronto Disability Pride March runs from Queens Park (111 Wellesley Street West) down Bay Street to the Ryerson School of Disability Studies (99 Gerrard Street East). For more information, see the map below. If you cannot see the map, and would like further information, please contact us. Please note: accessible washrooms are not available at Queen’s Park. Please see information on accessible washrooms below. We are meeting specifically on the south fields in front of the Queens Park legislature. 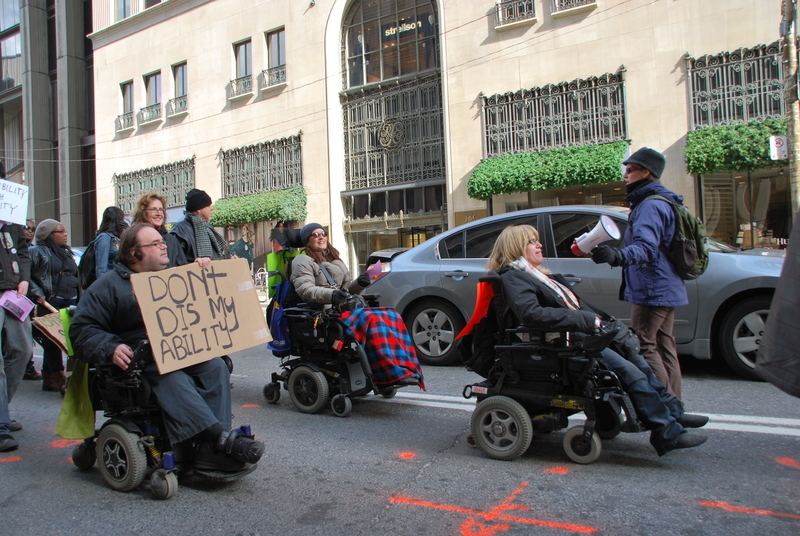 The closest accessible subway station to Queen’s Park is Queens Park, the closest accessible subway station to the School of Disability Studies is Dundas. For Wheeltrans users, both Queens Park and the Ryerson School of Disability Studies are searchable Landmarks on the Wheel-Trans website. For Queens Park, search under “Workshops, Offices”, and choose Queens Park-111 Wellesley W-South Ent (111 Wellesley St W, Toronto). Please choose a Drop-Off time before 1:00, that’s when we get started. For the Ryerson School of Disability Studies, search for Ryerson under “School, University, College”, and choose Ryerson University-Sally Horsfall Eaton (99 Gerrard St E, Toronto). We have some volunteers who can assist provide some physical assistance, but if you would manage better with someone to assist you through the entire event, please arrange that. Please keep in mind that the march is an inherently social, mostly outdoor event. We are family friendly. We recognize that this will not cover everyone’s access needs. We welcome suggestions, keeping in mind that we are grassroots funded by donation and our budget is pretty small. There are accessible washrooms near Queen’s Park, at the nearby Tim Hortons on the South-West corner of College and University. There are also accessible washrooms at the Ryerson School of Disability Studies.